Although Chillicothe City Schools don’t start until after Labor Day this year due to new construction, most of the other school districts in our area are back in session. It’s a good time to remind ourselves to be aware of stopped school buses and students walking to school. It’s also a good time to refresh the library’s hours. 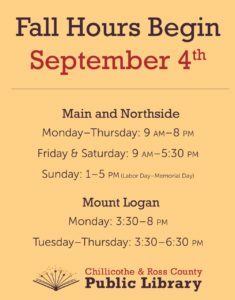 Every fall, the locations in town (Main and Northside), adjust weekend hours to include Sunday afternoons. It gives students (and families) a little more time to get to the library for research, computers, books, and movies. 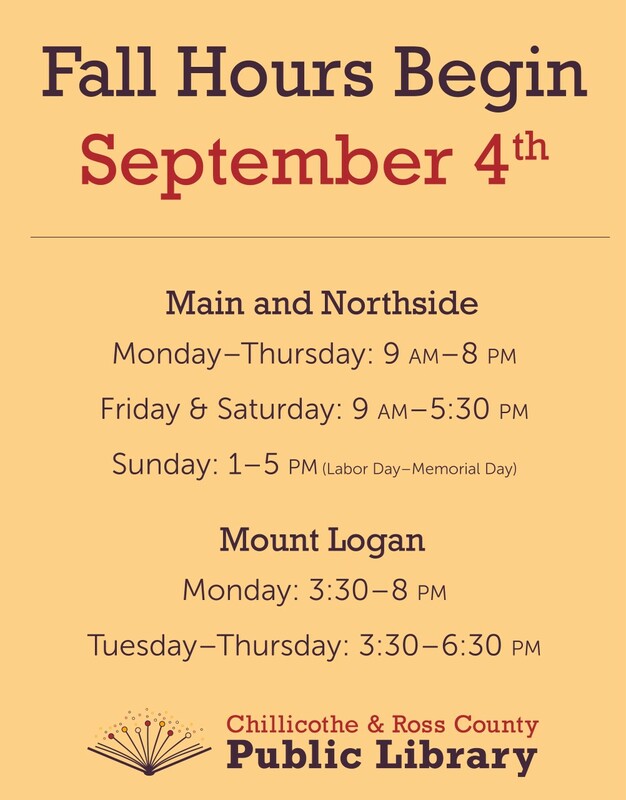 and, Mount Logan Library will have extended hours on Mondays, from 3:30 to 8 p.m.
We hope everyone has a great academic year and we hope to see you in the library!